Once upon a time there was a mommy. And this mommy promised her little girl allllllllll day long that after her nap she would wake up to a wonderful treat of peanut butter crunchy bars with chocolate drizzled on top. So when the little girl when down for her nap the mommy headed right for the kitchen…she was so excited to eat the peanut butter chocolate treats herself prepare such an awesome treat for her little girl. She measured and scooped and poured and stirred. The crunchy peanut butter bars smelled amazing. And now came the really fun part….the chocolate drizzled on top! Mommy went to the cupboard to get the chocolate pieces. But she could not find them. She looked high. She looked low. And everywhere in between. She began to sweat. How will I make the peanut butter crunchy bars with chocolate drizzled on top without the chocolate? I know I bought chocolate! And then she became angry. Smoke nearly started coming out of her ears. The mommy had not-so-nice thoughts running through her head of what she wanted to do to the daddy. She realized the daddy probably ate all of the chocolate pieces because daddy has a problem. A problem with consuming everything in sight that resembles chocolate in a matter of milliseconds. He’s like a really friendly chocolate monster. Mommy decided she was going to get a padlock for her chocolate cupboard. Not for the little girl or her baby brother but for her daddy. So, mommy decided to make a stiff cocktail lemonade out of the lemons she was given. She thought to herself. Hmm…what can I use instead of chocolate that will make these peanut butter crunchy bars taste as delicious as delicious can be? She thought of all of the options. Coconut. White chocolate. Pecans. I know, raisins! They’re chewy and sweet and wait a second…..THEY MAY MAKE THESE BARS TASTE LIKE PEANUT BUTTER AND JELLY BARS!!! And so she did. 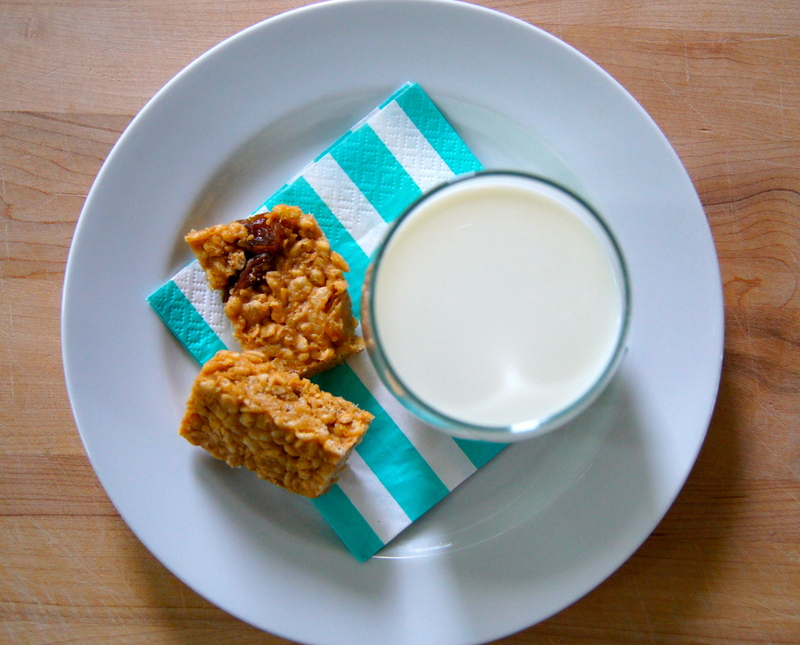 Mommy put raisins into these bars and magically turned them into the most surprisingly delicious after nap treat. The little girl was soooo happy her daddy ate the chocolate pieces because she loved the peanut butter and jelly bars so very much. Mommy, on the other hand, had a few words with him. The end. Notes: The only place I can seem to find crispy brown rice cereal is at Whole Foods Market…if you have found it anywhere else please fill me in…Id love to know! Grease a 8×8 baking dish with butter. In a large saucepan cook the peanut butter, maple syrup and honey until the peanut butter is melted and all of the ingredients are incorporated. In a medium bowl stir together the cereal, flaxseed meal, salt and raisins. 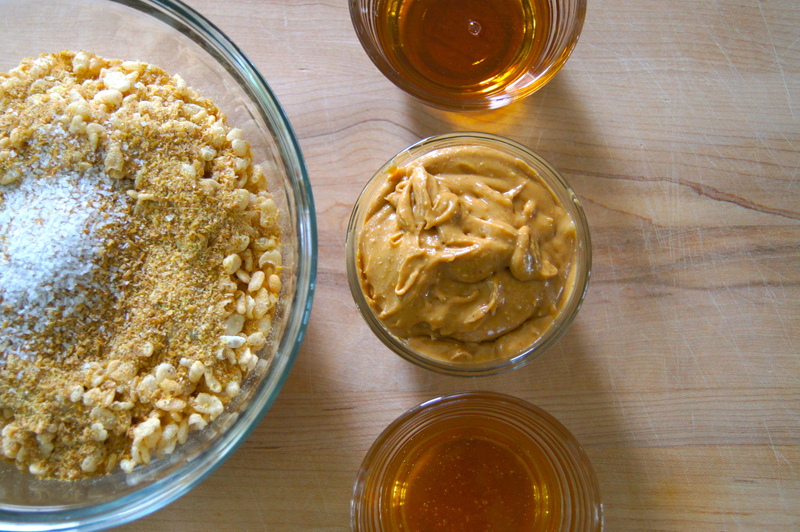 Add the bowl of dry ingredients to the peanut butter mixture and stir well until the dry ingredients are well coated. Pour into prepared baking dish and press the mixture down evenly with your hands until it is packed into the dish well. Set aside and let cool completely. Cut into bars and serve.